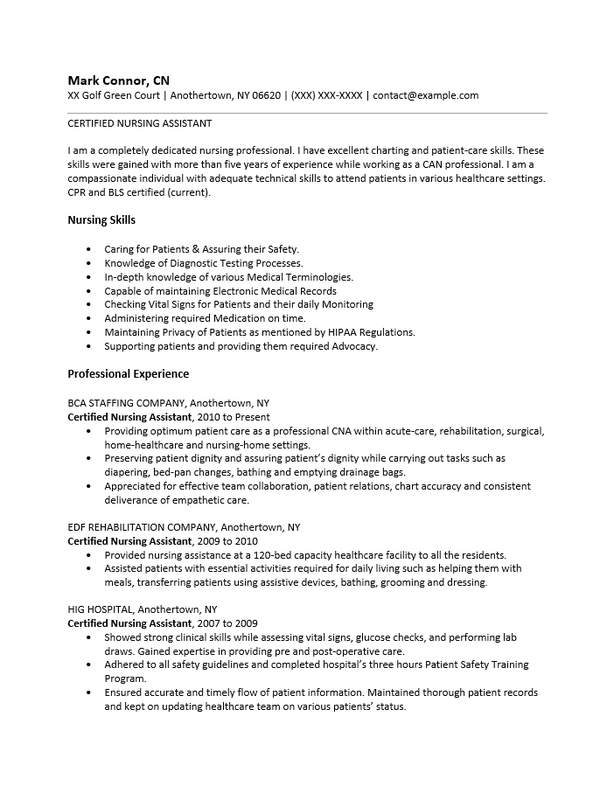 The Certified Nursing Assistant Resume Template provides a reliable method for creating a competitive resume. 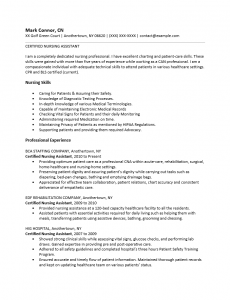 Certified nursing assistants carry a substantial amount of responsibility on their shoulders and their resumes must display information that would support the candidate’s ability to meet all the requirements of this field. These professionals must act as support in both patient care and administration. Some of the qualities that a certified nursing assistant must possess is an attention to detail in patient care, medical records, a knowledge of the law, an understanding of psychology and a strong sense of responsibility. After all, if a mistake is made at the wrong time it could potentially be life threatening to those under their care. Human Resource departments will require that a certified nurse report how they are qualified for the available position. This means that a candidate will have to deliver specifics regarding their academic credentials, experience, and licensing in an organized fashion on his or her resume. This particular template is geared precisely for this purpose. The sections contained will divide the information needed into a coherent document possessing an attractive eye-catching style. This level of organization will denote a certain sought after professionalism that increases an applicant’s chances of gaining an in-person interview. Step 1. The first line of the resume must contain the full name of the candidate (including any titles). Step 3. The First section of the resume is an introduction. It may be titled ‘Objective,’ ‘Profile,’ or the position title being applied to. There should be several statements (to be supported by the resume) stating your goals, experience, and/or skills. It absolutely must sound professional and should include at least some of the terminology required by a CNA. Step 4. The Professional Experience section must contain the work history of the applying candidate. This should consist of the name of the employer, location, position title held, date range, and a brief bullet list description of the functions carried out while employed there. Step 5. The Education section will deliver the educational credentials of a candidate to the recruiter. This information is vital to any resume in the health professions. It should contain the name of the institution where one studied, the location, any programs participated in, and if applicable the exact title of any degrees or certificates attained. Any supporting or impressive academic information should also be included.